A comprehensive range of stainless steel handrails, ready made to length kits for DIY installation, choice of tubular, square and flat profiles, with options for both indoor or outdoor use. Timber handrails available in a choice of lacquered beech and lacquered oak, suitable for indoor installation. All handrails available to order in various lengths up to 4 metres. 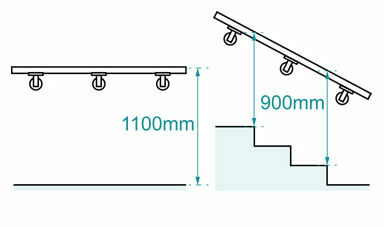 Handrails over 2.5 metres are supplied in two equal sections with a pre-fitted in-line connector for a quick and easy installation. 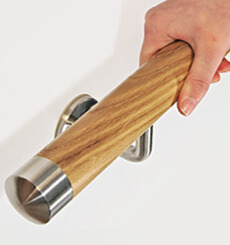 Baluster rails supplied with fitted end caps with pre-drilled fixing points for handrail brackets, prepared in our workshops to the highest of standards. All stainless steel tubular handrails in this range are based upon a tube wall thickness of 2.6mm ensuring that your installation is of the highest quality and will stand the test of time. Please allow 7-10 days for delivery of your ready made handrail. Beautifully crafted hardwood handrails offer a warm, soft touch that is perfect in any interior setting, available in a choice of lacquered beech and lacquered oak. Manufactured from environmentally friendly FSC wood, suitable for indoor use only. 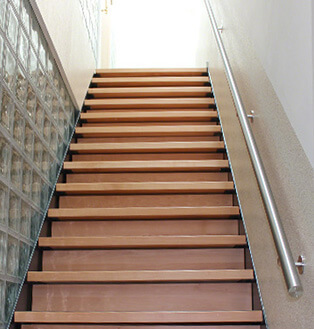 Lacquered beech hardwood handrail with stainless steel end caps and wall brackets. Simply choose the style of bracket you require. Lacquered hardwood oak handrail with stainless steel end caps and wall brackets. Choice of : Smooth Angle Bracket, Angle Plate Bracket and Tilt Adjust Brackets. 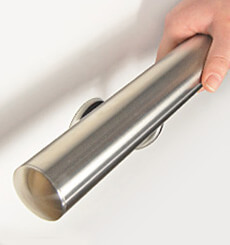 Tubular banister handrails produced from 316 grade stainless steel, for both indoor and outdoor use. The perfect choice for inclines and stairways, in a choice of 42.4mm and 48.3mm diameter tube with a range of fixed and adjustable handrail brackets to choose from. 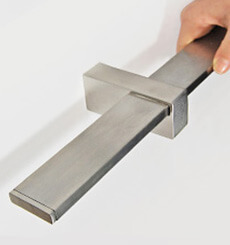 Dare to make a statement with this distinctive square handrail design, 40mm x 40mm profile handrail with a choice of components manufactured from 304 (interior) grade or (316 (exterior) grade stainless steel. Choice of : Angle Plate Bracket and Tilt Adjustable Brackets. 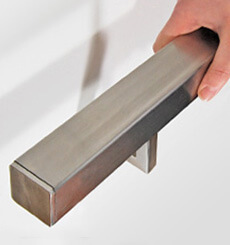 Stylish flat handrail with minimalist style mounting brackets. 40mm x 10mm profile handrail produced from high quality stainless steel with a brushed satin finish, available for both interior and exterior environments. For a quick and easy installation you will need a few household tools: pencil, tape measure, spirit level, drill, spanner/wrench and suitable rawl/wall plugs. For custom made to measure handrails, simply email or call our technical team on 01302 752 504. Simply specify your handrail style and provide measurements or drawings and our technical team can work out the perfect handrail for you. Stainless steel baluster railing and frameless glass balustrade systems, perfect for stairways and balconies. Beautifully designed and engineered, with options of solid bar, glass and wire infill available. If you wish to view our products or discuss your handrail project in person, simply call or email us in advance to book some time in with one of our friendly technical team. Showroom open 9.30am to 4.30pm Monday to Friday.